Tigre, Buenos Aires Province, Argentina - January 26, 2015 - Blog from Buenos Aires, Argentina | South America!! Sure is hot here! It was raining lightlty on our walk early this morning but the rain soon cleared away for the sun. Hope you folks at home save a little bit of winter for us. Buenos Aires is quite large but we have become comfortable with the major areas of the city. We have walked much of them and have used taxi and subway to cover any large gaps. The city sits to the north and east of the Rio de la Plate, the widest river in the world. The river is 150 miles across at the mouth where it empties into the Atlantic. Up the river a bit, 130 miles of river flows between Buenos Aires to Montevideo, Uruguay. Looking out over the water, one would never guess that his huge body of water is a fresh water river at al. It looks very much like an brown ocean. Like many large cities, Buenos Aires is divided into areas. Of the ten major areas, we have visited seven of them so far. We got quick introductions on our first day tour, but we have returned to some and visited new ones on our own. La Boca is famous for Caminito (colorful corrugated houses, street markets and Tango) and the La Boca Juniors Soccer Stadium. Puerto Madero is a former obsolete and abandoned port turned now into an ultra-modern area with expensive marinas, expensive restaurants and corporate offices. San Telmo is where we visited the famous antique markets yesterday, and the main area of the city is called Center. This area is where huge beautiful buildings housing government offices are found and it features many historical monuments, squares named after famous people and important locations. Recoleta is home of the Cementaria where bodies of famous and extremely wealthy families lay at rest in elaborate mausoleums. Today we visited Palermo and walked from the entrance of the botanical garden and zoo to Cordoba Street in Soho Palermo. We had read bout popular outlets featuring overruns of designer clothing. It was an absolutely lovely walk through the Palermo neighborhood on small, tree-shaded streets. There were in fact plenty of eclectic restaurants and cute shops in which to browse. We enjoyed a lunch of calamari and salad in an outdoor restaurant and had fun communicating with the waiter who spoke no English. I think he had as much fun as we did managing to communicate and introduce ourselves to one another. I never cease to be amazed that people we have meet all over the world want to connect, want to talk, and want to be kind to each other—whether it is a friendly waiter, a couple on the street helping with subway directions, or a helpful person warning us to take caution for pickpockets. Why is it that as individuals, we are so willing to smile at each other and help each other, but as a world, we have such a hard time getting along peacefully? Sad. We did make it to the outlet district only to be highly disappointed. Perhaps years ago it was a thriving center for cool stuff sold by the designer him/herself - but it is no longer. Before our afternoon adventure in Palermo, we had met our guide, Lillie, for a morning visit out of the city to the town of Tigre which sits on the Parana River. On the drive there she took us by yet another soccer stadium, the Monumental (the one that holds 70k people and is home to the Argentine national team, River Plate), by huge parks and past many clubs where people do all kinds of sports and recreation (swimming, rowing, kayaking, soccer, etc.). We passed through lovely well-kept suburban areas where the upper-middle class tend to live and commute into the city for work. Tigre is known for being on the delta. Years ago, immigrants inhabited this unusual area - which is a collection of marshy islands sitting closely among the convergence of 5 or 6 rivers. The immigrants cut down trees and replanted with fruit trees for their living. Years later, the market for fruit went bad and the immigrants left. The houses on the islands were purchased by city families and used as weekend houses. Seems that those who can afford to go to the beach, vacation at the beach; those who cannot tend to vacation or spend weekends in the river houses on the delta. There are no roads there, no bridges. Little even connects the land on which the houses sit. Some houses are really pretty; some look like river shacks. There are clubs on the islands that offer "beaches" and social activity but these are few. 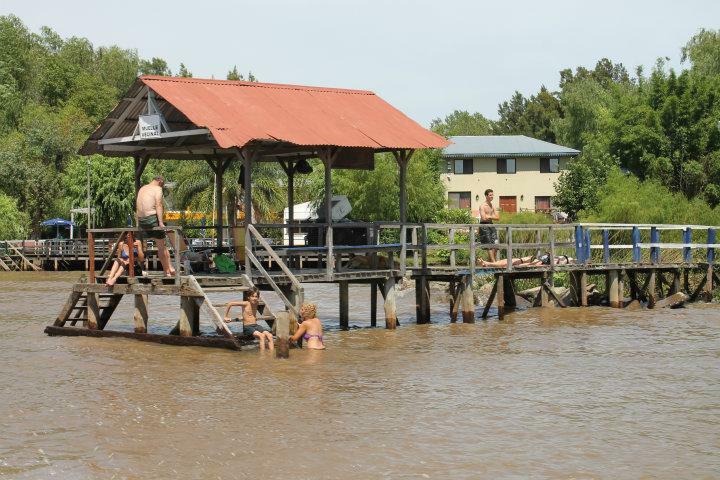 Except for taking the public boat back to the town of Tigre for dining, there are no restaurants or bars on the islands. Families must take their belongings and all the food and water they need for the duration they plan to be there. And they arrive by boat or waterbuses. Trash is collected by a garbage boat; there is a supermarket boat that can provide essentials; there is even an ice cream boat. I'm still not sure why people go there except that I guess it beats staying in the city. The fishing is bad; people swim in the water but I surely would not—looks like a big mud puddle; there are no bike trails or hiking trails; it is hot and there is absolutely nothing to do but eat and drink. It was remarkably interesting, but peculiar to say the least! I definitely prefer the beach house!!! Tonight ---- we are going to a Tango show! !